Technology is a wonderful thing. Rewind 30 years to 1984, and the first commercially available mobile phone, the DynaTAC 8000x, would set you back $3,995, a little less than $10,000 in today’s money. In the same year, the first Apple Macintosh computer cost $2,495. Today you can combine both products in an iPhone with more than a hundred times the processing power of the original Mac for less than a tenth of the price. It’s a shame that this sort of progress hasn’t been matched in the financial industry. Given the wave of deregulation, technology, growth in new markets and innovation over the past 30 years, you might have expected to see the same sort of quantum gains in efficiency in finance over the same period. 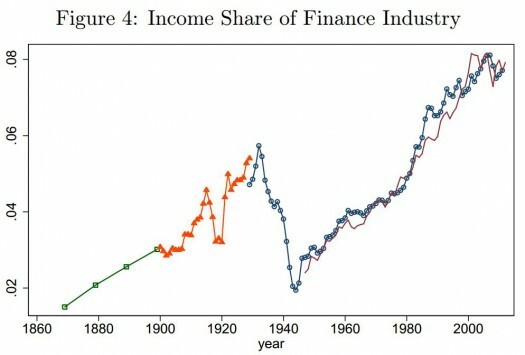 Philippon’s conclusions cut to the heart of the debate on the future of finance, and show how market participants have captured most of the rewards of technological progress and deregulation for themselves in the form of higher pay and bigger profits – largely by engaging in much more trading activity. 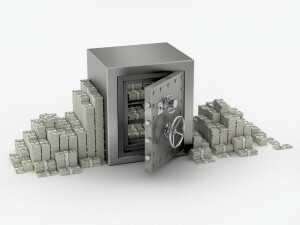 Addressing this apparent disconnect could play a significant part in the rehabilitation and healthy reform of the financial sector. First, Philippon measured the cost of finance relative to GDP and found it fell into three distinct phases. The sector grew rapidly from 2% of the economy to 6% in 1930, before declining over the next 20 years to less than 4% in 1950. It then grew slowly to about 5% in 1980, before accelerating rapidly to more than 8% of the economy in 2010. He then measured the output of the financial industry – or the creation of financial assets – which followed a similar pattern of rapid growth up to 1929, decline through the Second World War, gradual recovery from the 1950s to the mid 1970s, and accelerated growth up to 2010. Finally, he put the two together and found that the cost of financial intermediation – that is, the cost of finance relative to the production of assets – has remained puzzlingly constant over the past 130 years from around 1.5% of assets to 2%, but there is a clear uptick over the past 40 years when you would expect the opposite. How did this happen? Why, in Philippon’s words, did we get the bloated finance industry of today instead of the lean efficient equivalent of Wal-Mart? The research is at an early stage but Philippon’s initial thesis is that a lot of the technological and regulatory gains have been ploughed into a surge in secondary market trading over the past few decades. This has increased the income that the finance sector generates from the financial assets it has created, without necessarily benefitting the owners of those assets. 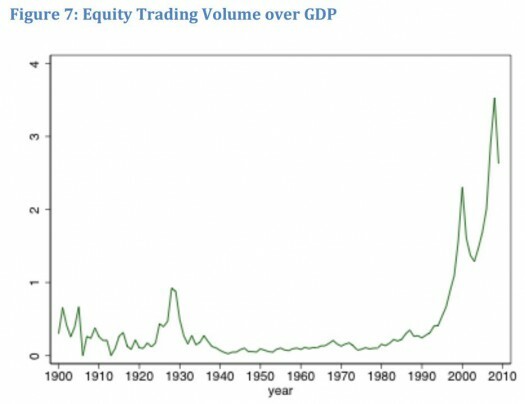 FX trading volumes have increased by roughly 200 times since the 1970s, and equity trading in the US has risen 20-fold in just the past 20 years. Of course, the unit cost of trading has fallen sharply, but the benefit has been largely captured by the finance industry. It’s not just banks: asset managers have displayed the same sort of behaviour. The average fee on mutual funds in the US has increased marginally over the past 40 years, despite advances in technology and a big increase in low cost index-tracking funds. Between 1980 and 2010 the average headline fee for mutual funds increased from 66 basis points to 69 bps, according to research by Burton Malkiel, author of A Random Walk Down Wall Street, and one of the early advocates of the efficient market hypothesis. Over this period, assets under management increased from just $25bn to $3.5 trillion – which you might expect would bring some economies of scale – and index funds went from being an insignificant part of the industry to roughly 30% of assets. That means that the fees on actively managed funds have increased even more – by nearly half – and investors in those active funds are incurring higher additional costs on top of that because the assets in their portfolios are being traded much more heavily today than they were 30 years ago. 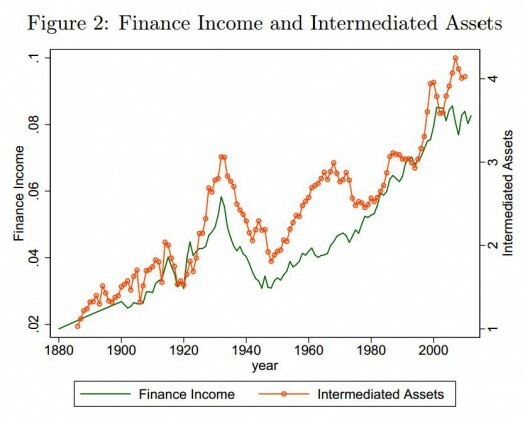 The broad conclusion from Philippon’s work at a macro level is that modern economies are allocating resources to the finance sector well beyond the point at which those resources can be productively employed. At a micro level it suggests that a lot of financial activity is generated for the sake of the finance industry itself. If finance is to win the argument over its rightful role in the economy and in society, it could do worse than thinking about handing back some of those efficiency gains to issuers and investors. 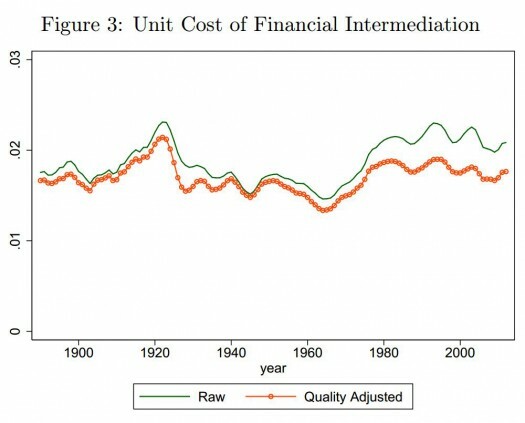 Philippon’s most recent paper from December 2013 on the cost of financial intermediation in the US is available here. A shorter and earlier version of the paper is available here.